Learn how to sign up for an interview and what to do if no interviews are showing up on your app. If you passed the application, you will be able to sign up for an interview right in your app. You will see the "Browse Interviews" button on your home screen. You can also access the available interviews by selecting "Browse Interviews" from the menu located in the upper left hand corner of the app. Read the entire description, scroll through to the reviews at the bottom of the post and then you will be able to "accept" the interview. This will allow you to sign up for an interview and join The Crew! What if interviews aren't showing up on my app? This may mean that there aren't any interviews in your area for the week. Don't worry, we typically post new interviews every week, so if there aren't any, continue to check the app and be sure your notifications are on so that you don't miss anything. 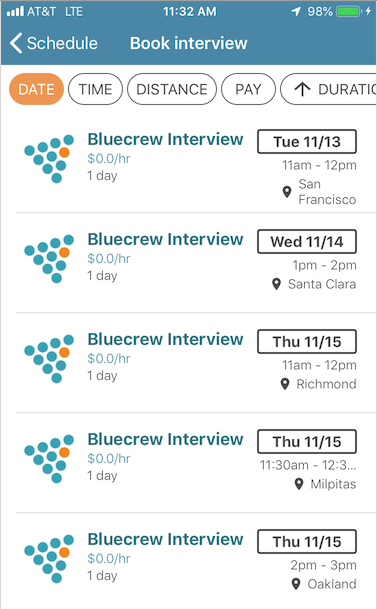 Previously failed interviews or previous termination from BlueCrew will prevent you from seeing the interviews available in your area. In these cases, your account will show as inactive.